A modern testament to the possibility of contemporary architecture complimenting its natural environment, Casa Peninsula is more than just a luxury residence; it is a serene cliff top sanctuary in nature offering simply breathtaking views. Whoever sees it from outside also faces the beauty if its architectural landscape. Overlooking a bay from a lush, green cliff, this private residence in Guaruja is split over three levels, the ground floor, featuring four guest rooms and a TV room, the middle level hosting the dining room, living room, kitchen and swimming pool, and the top floor containing the bedrooms for the owners. From a bird's perspective, the triangular pool is perhaps the most striking, but when looking from the North towards the best sunshine, the structure seems as if it were perched on a plateau. 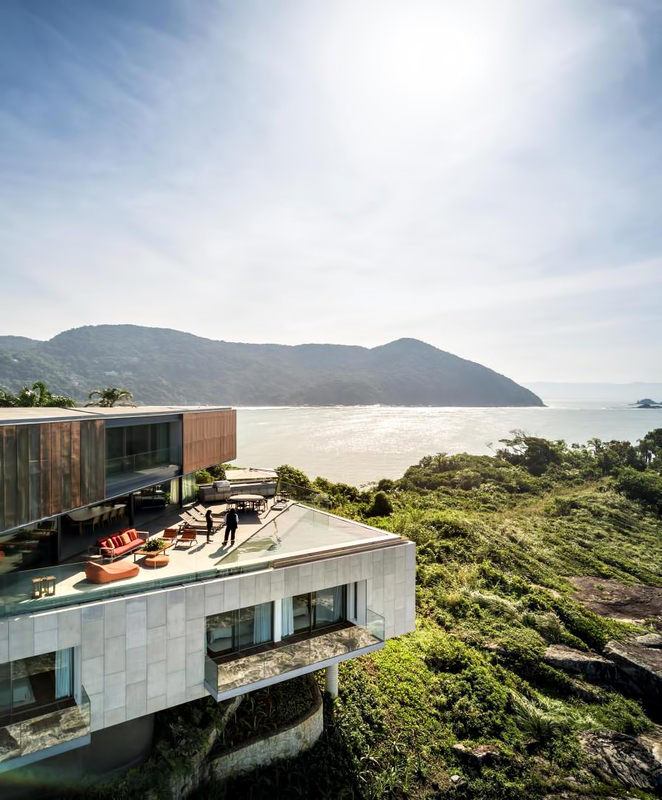 The cleaver aspect of this three-story residence is that seems to be very light, just on the hillside as if it were suspended over the sea below. A true luxury retreat, Casa Peninsula offers unsurpassed views that appear as if they extend outwards, taking your gaze with them, over towards the horizon. This is true serenity.